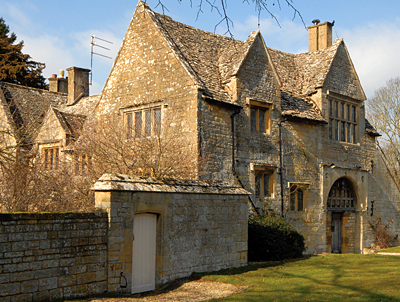 Once again, the Cotswolds is leading the country-property market out of recession. In sharp contrast to the edgy top end of the sector, where Edward Sugden of buying agents Property Vision reports a 40% drop in the number of houses sold in the area for more than £3 million (and none at all sold for more than £5m), there is a real buzz in the market for houses priced between £1m and £3m. The Cirencester office of Knight Frank, for example, agreed sales on 85 houses in March this year, compared with their normal monthly average of 50 houses sold. The quintessential Cotswold town of Broadway was one of six new market towns founded after the Conquest, along with Chipping Campden, Moreton-in-Marsh, Stow-on-the-Wold, Burford and Northleach. The Normans built a stone church in nearly every manor and much of the land was owned by monasteries until the Dissolution, when the new gentry added their legacy of gabled stone houses. It’s all part and parcel of the Cotswold idyll projected by exquisite houses such as The Court in Broadway, which comes fresh to the market through Smiths Gore (01451 832832) at a guide price of £2.4m. The Court, listed Grade II*, was built in about 1600 as a gatehouse to nearby Broadway Court (once part of Pershore Abbey), which was demolished in the late 1700s to make way for a new manor house on the Savage family’s nearby Middle Hill estate. The gatehouse, built on two storeys with a stone-slate roof and mullioned windows, carries the crests of the Savage, Sheldon and Daston families who were major local landowners at that time. In the late 1890s, The Court was restored and substantially extended by the well-known Cotswold architect Sir Guy Dawber, who, as a young man, fell in love with the area and its architecture, while overseeing work at Batsford House near Moreton-in-Marsh, a neo-Tudor mansion designed by his mentor Sir Ernest George, and built in 1888-92. The Court stands in 7.3 acres of partly walled gardens and paddocks within an AONB overlooking the Cotswold escarpment, three-quarters of a mile south of Broadway. The 4,930sq ft house has five reception rooms, a new kitchen/breakfast room, master and guest suites, five further bedrooms, two bathrooms and a pretty indoor courtyard. The vendors have secured planning consent to incorporate the courtyard into a new glazed inner dining area. Smiths Gore are offering another Guy Dawber landmark, the Grade II-listed Tower House at Netherswell Manor, near Stow-on-the-Wold, at a guide price of £1.1m. The 3,300sq ft former east wing of the neo-Jacobean manor built by Dawber for Sir John Murray Scott and his brother Walter in 1903 is one of three manor-house conversions created at Netherswell by house-builders Charles Church who bought the estate in 1998. Described by selling agent Robert Pritchard as ‘the perfect downsizer’s house’, the Tower House has three reception rooms, a kitchen/dining room, a master suite, three bedrooms, two bathrooms and a castellated third-floor tower room, currently used as a study. It stands in its own private gardens at the end of a half-mile drive, overlooking the estate’s 10 acres of woodland and communal gardens. Back in Broadway, The Old Mill in Cheltenham Road was one of two mills owned by the Savage family of Middle Hill between 1640 and 1795, when it was sold, first to the Smith family and then to the Burrows family, who were the owners when a serious fire broke out in 1897. The village had no fire engine and the mill had water but no pump, so innkeeper John Cordell of Broadway’s Lygon Arms rode through the night to summon the Evesham Brigade, which eventually put out the blaze at 6am. Three months later, the Broadway Fire Brigade was set up, and The Old Mill was rebuilt as a private house. During the last century, the house had a succession of owners, including the eccentric Capt Kenneth ‘Ginger’ Storey, who filled the garden with rare plants collected from around the world. Current owners Peter and Pauline Martin have lived there for 17 years, during which time they have reinstated its traditional English interior (the previous owners were American) and have done a ‘colossal’ amount of structural work to the building and watercourses. The substantial L-shaped building, which is unlisted, stands in an acre of delightful gardens, and has four reception rooms, a farmhouse kitchen, seven bedrooms and two bathrooms. Jackson-Stops & Staff in Chipping Campden (01386 840224) quote a guide price of £1.5m. For sale for the first time in 56 years, through Knight Frank (01285 659771) at a guide price of £2.75m, romantic Winson Mill at Winson, four miles south of Northleach, was the cherished family home of local solicitor Simon Logie, who died last year, and of his father before him. Built of traditional Cotswold stone under a stone-tiled roof, the picturesque, 5,974sq ft, 17th-century former mill house, listed Grade II, stands in 8.4 acres of enchanting gardens and paddocks on the banks of the River Coln, with the mill-race forming the other boundary to the garden. The house, which has been cleverly extended into the mill building over the years, includes three reception rooms, a dark room, a kitchen/breakfast room, a master suite, four further bedrooms and a bathroom, plus extensive attics with obvious planning potential. The dream includes 530 yards of fishing on the Coln. Originally built in the 1600s and remodelled for John Lockey in 1719 and again in the early 19th century, Lockey House at Langford, six miles south of Burford, was an inn from 1880 until 1926, when it again reverted to private use. Having bought Lockey House from long-term village residents the Kemp family, owners Ian Dunstall and his wife, Susan, a garden designer, have progressively renovated the charming, three-storey family house which has four reception rooms, a kitchen/breakfast room, six bedrooms, and two bath/shower rooms, plus a one-bedroom cottage and a storage barn. At the far end of the beautifully landscaped walled garden is a charming gazebo, built as a folly by a previous owner who would retreat there with a glass of wine to watch the cricket on the village green. Lockey House is for sale through the Burford office of Jackson-Stops & Staff (01993 822661) at a guide price of £1.3m.